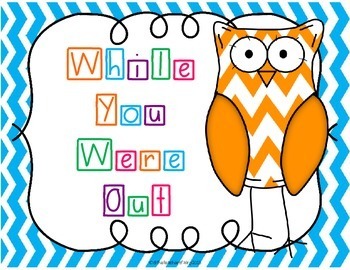 "While You Were Out" will help student absence become a breeze! 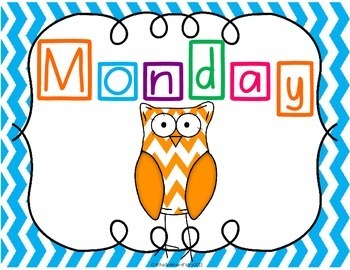 With this easy system, students will have a system in place for where to go for information, who to talk to about what information they need to turn in, and you (the teacher) will have a system for keeping up with what work has been turned in! 1. “While you were out” Poster: I laminate this and place on metal rings around a cute color plastic basket/bin (like an old milk crate) and place on a shelf. This gives students an easy view of where all missed work is placed. 2. Days of the Week posters (Monday-Friday): print on card stock/laminate. 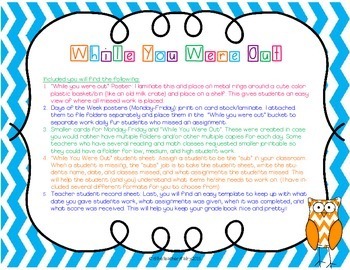 I attached them to file folders separately and place them in the “While you were out” bucket to separate work daily fur students who missed an assignment. 3. 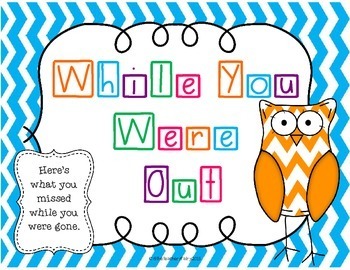 Smaller cards for Monday-Friday and “While You Were Out”. These were created in case you would rather have multiple folders and/or other multiple copies for each day. Some teachers who have several reading and math classes requested smaller printable so they could have a folder for low, medium, and high student work. 5. Teacher student record sheet: Last, you will find an easy template to keep up with what date you gave students work, what assignments was given, when it was completed, and what score was received. This will help you keep your grade book nice and pretty! !